When you walk into King's, your immediate reaction upon seeing the cakes is 'Oh..they're SO beautiful…I'd hate to eat one!' But eat you must as these cakes are 'works of art', made laboriously from scratch from ingredients flown in from Malaysia and are absolutely scrumptious to the palette, making them wonderful gift ideas for family and friends. For Christmas, King's is selling special Ginger Houses with chocolate and raisin fillings at Tk.800. Each cake is shaped like a small house with colourful 'smarties' roof tiles dusted with 'frosted' snow, complete with green 'shrubs' and even Santa out by the front door! And, they're beautifully wrapped in transparent boxes with red and grebe ribbons. There are crispy Ginger Mans or cookies with chocolate and raisin fillings, shaped like Santa bearing gifts and a Christmas tree priced at Tk. 50 each. King's Black Forest and Black Beauty cakes are available in special Christmas designs priced at Tk. 1,300-1,400 for 1 kg and Tk. 700-800 for 1 lb (1/2 kg). Also check out the Chocolate Rolls shaped like tree logs priced at Tk. 300 each. To savour these yammies visit their outlet at Banani 11. A household name when it comes to bakeries, Cooper's recently received a certificate from the Mobile Food Court for maintaining excellent hygienic standards in each and every step of their baking process. 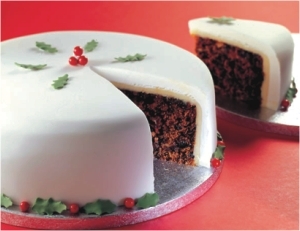 Check out their traditional Christmas Fruit Cake, 1 kg of which will cost around Tk. 600 and the crunchy Ginger Biscuits available at Tk. 25 per 200 gm. They're also having yummy Plum Puddings at Tk. 300 for 1 lb (1/2 kg). In addition to this, you can check out their now-famous Chocolate Ganish and Fudge Cakes available at Tk. 770 for 1 kg. Coopers is located at Metropolitan Shopping Plaza, Gulshan 2· Old Airport road near Bijoy Sharani circle and Mascot Plaza, Uttara. As Shumi herself says, sales soar during the festive period of Christmas and New Year's with people placing last minute orders even on Christmas Eve! In addition to the mouthwatering Brownies and Chocolate Fudges available throughout the year at Tk. 20 each, you can order Vanilla, Chocolate, Black Forest and Special Black Forest cakes in Christmas Tree, Santa or whatever shape takes your fancy. Starting from 1 lb to 10 lbs, the Vanilla cakes cost Tk. 150 to Tk. 1,500, while the Chocolate and Black Forest cakes cost Tk. 175 to Tk. 1,750. The Special Black Forest will cost Tk. 200 to Tk. 2,000. Their branches are situated at Banani 11 and at J&J Mansion, Sobhanbagh. MAPLE International Ltd recently launched a new brand of mobile phones titled I-Mobile in the city's Sheraton Hotel. In a different twist to most launchings this one featured a “Mobile Camera Photo Exhibition” where photos taken by eminent photographers Sujan and Pia were set on display. Their idea was to merge the world of mobile phones with photography in order to create a fusion and they were hugely successful in their endeavour. The photos were all taken by the I-Mobile cameras and therefore proved a diversified showcase of talent. Be sure to check out the I-Mobile sets. DECEMBER is a month of festivals and Sheraton is celebrating Christmas and the countdown to the New Year! The Christmas Children Party will be filled with assorted roaming performers i.e. Puppet Show, Magic Show, Puzzle Show, Carol Singing, delicious treats and Santa will be there to distribute presents. An Attractive Raffle Draw will be there for kids and parents. Children would also enjoyed delicious food along with Candies and Ice cream. This Christmas, the year-end festivities begins with Christmas Carols in the evenings at the Tea Lounge, and all the Restaurants from December 17 to Christmas Day. Guests can enjoy delicious lunch and dinners at the Bithika restaurant specially designed for this Christmas. So if you want a taste of Yuletide yummies, hop on over to the Dhaka Sheraton hotel for an unforgettable time. Persona Adams an exclusive beauty salon for men was launched this 15 December. This elegantly designed new age salon is offering exclusive health and beauty enhancing services for both men and children. In a nurturing environment spread over around 2000 sq ft the new outlet is offering haircuts, skin treatment, hair colouring and henna application along with body massaging, re-bonding, fashion piercing straightening, manicure/pedicure and groom preparation. A sister concern of Habib's@Persona, Persona Adams is located at Dhanmondi, on road 27, house no. 405. EXCLUSIVE shop for belts, Waist Engine, is offering a special price reduction of 10% for the event of the New Year. Presenting belts of unique styles for men, women and children, this shop is holding this sale from December 24 to 31. That is not all folks. Those who were born on 31 December are the most lucky ones. They will enjoy a special discount of 50% on all the products. So hurry up and grab some stylish belts while this sale lasts. The showroom of Waist Engine is in Anam Rangs Plaza on Road 6, Dhanmondi. A&W restaurant is a worldwide fast food franchise. It has been a year since it has opened up an outlet in Bangladesh. Situated in Gulshan Avenue, A&W celebrated the first anniversary on 15 December 2005. A&W specialises in being the only restaurant in town that offers root beer, which for the uninitiated is a rather strong tasting non-alcoholic drink, topped off with a scoop of ice cream. Other than that they offer many beef and chicken items. Also they offer huge fried onion rings as appetizers. All the food items are imported to meet the stringent quality control requirements of the parent company. The event was a rather subdued affair with the outlet looking hardly any different than on usual days. Despite that it was jazzed up with the presence of noted celebrity magician Jewel Aich. Along with that many members of the media were present to get a taste of what's on offer. It seems that the lightly fried chicken is a big hit. The event was wrapped up with the appearance of A&W's own mascot a huge furry brown bear. The bear puts on a show for all the children's parties hosted at the venue. During the anniversary party, assistant manager Sujit Ghosh informed that A&W has plans to expand their business by opening up more outlets in Dhanmondi and also in Chittagong. Customer demand puts quite a bit of pressure on the lone outlet so additional outlets will ease this situation as well as hopefully lower the prices a little. This is something fast food lovers can definitely look forward to. Rong is celebrating there 11th anniversary this December. On the occasion, they are offering a special 5 to 10 percent discount. Starting from 20 December the offer is valid till 27. Kay Kraft will hold their annual winter festival on the 23rd of December at 5pm at their Baily Road showroom. There will be a wide array of foods on display, both foreign and traditional, for the guests. Aside the plethora of food items there will also be a medley of clothing items to choose from scarves and mufflers to shawls, dresses and T-shirts.